How can my breathing be improved with a rhinoplasty? Rhinoplasty is a surgical procedure which improves the appearance and function of the nose. These aims are achieved by techniques which reshape the underlying nasal bone and cartilages as well as correcting any congenital or post-traumatic abnormalities. An open rhinoplasty refers to an extra small incision being made across the narrowest section of the columella (the central tissue between the two nostrils). This is then connected with two incisions that run inside the nostrils (infra cartilaginous incision). This extra columellar incision is approximately 6mm long and allows the skin and subcutaneous tissue to be lifted off the framework and skeleton of the nose. The advantage is that it allows for greater exposure for performing a rhinoplasty. It is almost always required if there is a significant amount of tip work required, if it is a revisional procedure or in the more extensive form of rhinoplasty. In contrast, a closed rhinoplasty only uses incisions that are hidden within the nostrils with no external incisions being made. This is a useful technique for the more simple form of rhinoplasty such as removing a dorsal hump or narrowing the width of the nose. This technique is generally not used if there is significant tip work to be performed or if it is a revisional procedure. A simple incision is made through the nostril and a soft silicone prosthesis is inserted to lie on the bone and cartilage of the nose underneath the skin and the subcutaneous tissues. This is a relatively simple procedure and is particularly useful in patients who are requiring an augmentation only. It is a common operation performed particularly in patients of Asian ethnicity who are seeking a more prominent dorsum to the nose. This has both aesthetic and functional benefits as patients generally find it easier to wear glasses after this procedure is performed. Rhinoplasty can be performed as a “closed” or an “open” technique. The closed technique is performed without the need for any external scars on the nose. Not all cases are suitable for closed techniques. Dr. Belt will plan your specific operation taking into account your wishes for the cosmetic appearance and function of your nose. This surgery can performed as a day case procedure. Drains are not used. You will be given a prescription for strong painkillers upon discharge from the hospital. Packs placed inside the nose will be removed the next day. A small amount of bleeding may be experienced during the first 24 hours. This is easily mopped up with a small pad placed under the nostrils. A splint will remain on the nose for one week. Stitches will be removed at the same time as the splint. Rebates may be available through both Medicare and Private Health Funds. 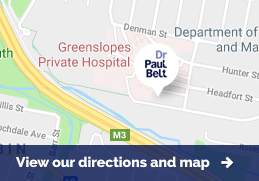 Please contact Dr. Belt's rooms and his staff can answer any questions you may have. A personalised quote and information can be sent to you regarding your procedure. The risks will be discussed with you in detail before you consent to the operation. The risks can be broken down into general risks associated with any operation, and those specific to rhinoplasty surgery. Specific complications include: appearance - healing problems, visible external scars, wound breakdown, unsatisfactory final shape ; functional problems - septal perforation, septal loss leading to collapse of the nasal bridge and airflow obstruction. Dr Belt will correct any deviation of the septum and nasal bones and this will produce greater symmetry of the internal airway. Furthermore, the use of spreader flaps and grafts will improve the cross sectional area of the internal valve of the nose and as a consequence will lead to a much improved airflow. The spreader flaps or grafts re-use the excessive cartilage (upper lateral cartilages) that are routinely removed when reducing the dorsal hump or bump in rhinoplasty. According to the laws of Physics (Poiseuille’s law) where the laminar flow rate depends on the fourth power of the radius), a small difference in the internal diameter of the nasal airway makes a massive difference to airflow.